Meet Alexandra Gold, PA-C our new obsession with a youthful glow! The topic hot on everyone’s lips, Juvederm! At MyTopFace we are passionate about finding the best in the business. That is why when we had the opportunity to work with Alexandra Gold PA-C (@thedermdiary) we were thrilled. Her passion is lips and microneedleing, so we were excited to get to work with Alexandra to achieve our perfect pout! Our MyTopFace Beauty Expert arrived one very snowy day to the Upper West Side location of Schweiger Dermatology Group to meet with Alex for lip injections and could not have received a warmer reception. We sat down with Alex to learn more about her, her best tips for a glam glow and more! MyTopFace: What motivated you to get into Dermatology? Do you remember an A-HA moment that drove you into the field? Alexandra: I realized soon after starting PA school that I was a visual learner. As we went through each segment of our education (Cardiology, Pulmonology, etc), I really found that I loved dermatology since I can often diagnose immediately and give my patients on the spot recommendations. I do not need to rely on X-rays or MRI imaging to diagnose and treat many of the skin conditions that I see daily. Cosmetically – what’s not to love?! It is a wonderful feeling to make other people feel more comfortable in their own skin. It is fun to use fillers to artistically shape a face with volume loss into a more natural and youthful face, it is rewarding to treat acne scars with microneedling and Fraxel laser, and it is enjoyable to introduce patients to the best new products out there. MyTopFace: What is your favorite procedure to perform? Alexandra: This would be a tie! I equally LOVE performing microneedling and lip injections. Microneedling is such a great procedure to shrink pores, tighten skin, and work on fine lines and wrinkles. The procedure is minimally invasive and a topical numbing cream is applied so that it is painless. Patients can apply makeup the next morning and go about their day as usual. I also love doing lip injections. The results are instant which is extremely gratifying for patients. The results last about one year. MyTopFace: Tell us what your favorite or most rewarding moment has been thus far in your career? 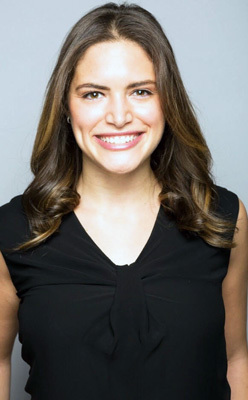 Alexandra: The most rewarding moment is each and every time that I see a patient that was once self-conscious and suffering from acne come into the office with clear skin. Their new-found confidence is something you can’t find in a bottle. MyTopFace: If you could give one piece of beauty advice to your younger self, what would it be? Alexandra: SUNSCREEN! I wish my current self would have told my younger self to wear spf30+ daily and re-apply every 2 hours! MyTopFace: Best piece of beauty advise you have received? 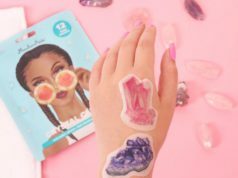 MyTopFace: What are some of your favorite products right now? MyTopFace: What is an upcoming trend in the industry that you are excited about? Alexandra: I have been seeing microneedling with radiofrequency gain popularity. After the needles cause micro-trauma to the skin, radiofrequency heat is then delivered to the deeper layers of the skin. The micro-trauma caused by the needles stimulates collagen and elastic production and the radiofrequency energy helps to tighten skin and treat scars. Overall, the addition of radiofrequency enhances results of microneedling without increasing downtime. 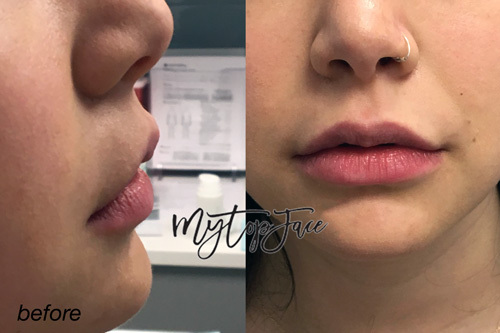 MyTopFace: Talk to us about when someone should start with fillers and Botox? Preventive Botox seems to be a leading trend these days! Alexandra: The best time to start botox is when you start to see static lines on your forehead or between your brows. Static lines are the lines etched into the skin after making an expressive face. Over time, those lines turn into deeper wrinkles that are harder to treat. Essentially, we use Botox to stop the muscle movement that causes those lines to form, thus preventing wrinkles. Fillers are used to restore volume loss. When we lose volume, for example, in your cheeks, that causes the skin to sag. Under the eyes, when we lose volume, it produces a shadow or “dark circle.” Lip fillers can be done anytime for someone who is unsatisfied with the volume of their lips. MyTopFace: What is your favorite brand of filler for the lips? Which have you had the longest lasting results with? Alexandra: The best brand to use depends on what the patient is looking for. For pure volume, I really love Juvederm Ultra XC. It plumps up the lip beautifully. It can also be layered with other fillers, such as Volbella, for a plump and hydrated look. For a more subtle plump, I would use Restylane silk. 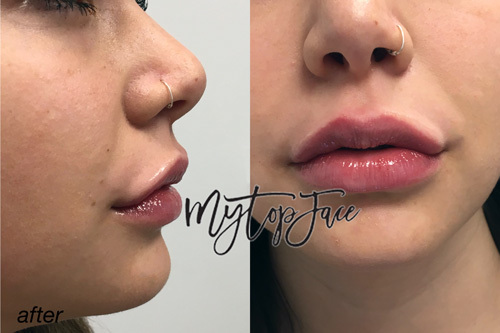 MyTopFace: It seems like there is a trend that has been changing, especially in New York in regards to Botox and injectables in general. Would love to get your take on this! Alexandra: Previously there was a huge emphasis on the “I don’t want anyone to know what I’ve had done” mentality. It’s shifting to a trending prominence of preventive medicine which is great. What happens with the lines on your face, is they are from muscle movement and making expressions, over time with movement these muscles get stronger and stronger creating what we know as wrinkles. With Botox, you are preventing the muscle movement. So, you are paralyzing the muscle and preventing the lines from even starting. Doing this every 4 months when you are young and still don’t have these lines can make for less maintenance in the future. You might only have to go every 6 months instead of every 4. After the topical lidocaine numbed our lips a bit we were ready to start. Alex also had us ice our lips for a few minutes to decrease swelling later down the road! Our first few injections did hurt a bit since the skin around the lips is sensitive but were really relatively painless. We used less than 1 syringe of Juvederm XC and will return in 2 weeks to have the rest used! Our overall experience with Alexandra was absolutely excellent. Alex made sure to explain each step of the process to us and asked us several times to make sure we were liking the shape and the way the lips were turning out. This is such an important quality in a provider as when you are working with injectables it is easy to look unnatural. Alex is such a professional and understands the best methods to plum your pout! We are very excited to see Alex in the future for more procedures and would HIGHLY recommend making an appointment with her. She will take the best care of you.